The virtual network is a combination of virtual switches and their uplinks to a physical network that isolates a network environment. It requires a minimum of one physical uplink and one virtual switch, although it can have more virtual switches. Virtual networks are used to manage the connectivity and traffic between virtual servers and the physical network. Some of the features and limitations of virtual networks and virtual switches are determined by the hypervisor. As shown in Figure 1, a host has six physical NICs connected to the corporate physical switch. Virtual Switch A was created with 2 NICs, Virtual Switch B with no NICs, and Virtual Switch C with 2 NICs. 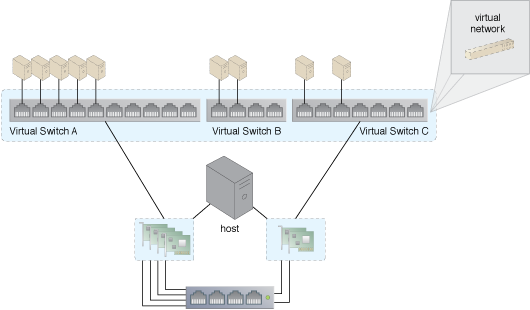 Network policies have forced some of the VMs to connect to the 3 virtual switches independently. The virtual network consists of Virtual Switch A, Virtual Switch B, Virtual Switch C, and 6 uplinks. Figure 1 – An example of a virtual network.